Ben Stokes is hoping England can finish the fourth Test quickly on day three after his five wickets put them on the brink of reclaiming the Ashes. England lead Australia by an innings and 90 runs and need three wickets to claim an unassailable 3-1 series lead. Durham all-rounder Stokes, 24, took 5-35 at Trent Bridge on Friday. "We're in an unbelievable position," said Stokes. "The crucial thing is that we go out tomorrow and make sure we don't have to get the pads on." Bat and throw? Why not play for Australia? Having bowled Australia for just 60 on Thursday morning, England extended their lead to 331 before declaring at 391-9 on day two. Stokes took advantage of favourable conditions with a spell of 3-16 off seven overs around tea that cemented England's dominance after Australia openers Chris Rogers and David Warner had added 113 for the first wicket. "It is good to get a bit more responsibility," said Stokes, who was not required to bowl in the first innings as Stuart Broad took 8-15. "It helped that the ball was swinging. "We're a bowler down with Jimmy (Anderson, who is injured) so there was more responsibility put on all of our shoulders. "Obviously Broady put his hand up and bowled fantastically well in the first innings and we had to back him up. We couldn't all rely on him in this innings but everyone has put their hand up and done well." Stokes also contributed again in the field, adding to the spectacular catch he took to dismiss Adam Voges in the first innings with another, off Broad, to remove Steve Smith in the second, shortly after the batsman had driven past him for four. "The first one he flayed past me but then Cooky [captain Alastair Cook] moved me a bit squarer. I had a chat with Broady and he told me to stand where the previous one had gone and it went straight in." 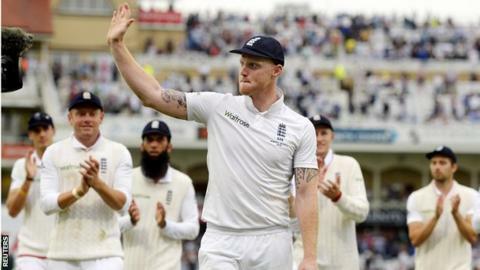 Stokes was part of the England team that were whitewashed 5-0 down under in 2013-14. "It is a completely different feeling to being in Australia," he added. "At this stage in that series we were 3-0 down and now we are on the brink of getting the Ashes back. It is fantastic to be part of it." Australia fast bowler Mitchell Starc, who took career-best figures of 6-111 before England declared, said: "It's been a tough couple of days of cricket but we are still alive. "We'll come out again tomorrow and fight as hard as we can, that's the Australian way.